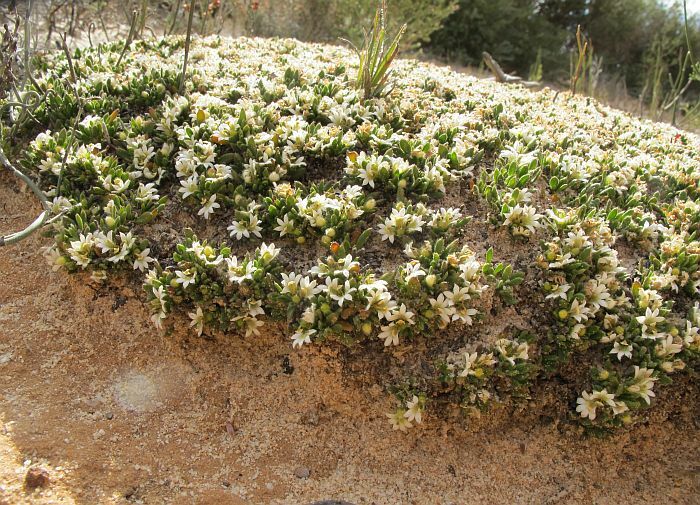 The Scaevola genus has over 100 species and is the only one in the Goodeniaceae family to also occur outside of Australia, although most are Australian endemics and are distributed in all States. Many plants in this genus are shrubs, rather than short-lived herbs (more common in the other genera), so are frequently used in garden landscaping where they are also known as Fan Flowers. 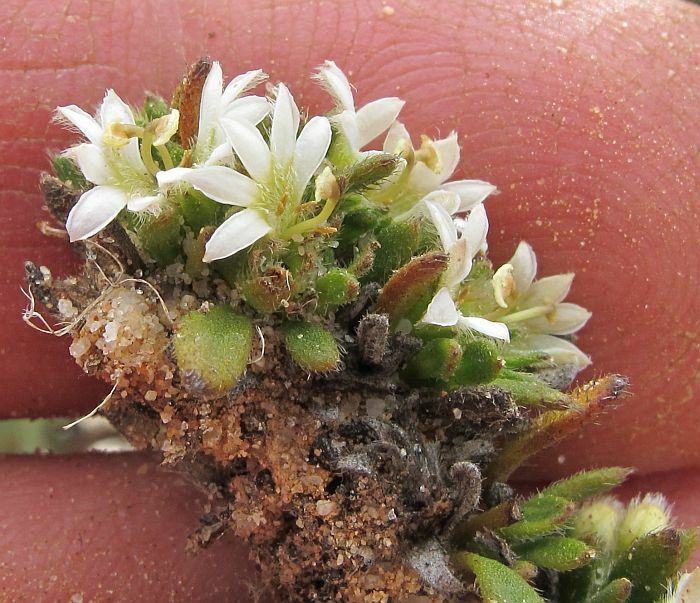 Scaevola humifusa is not officially recorded for the Esperance region, but does with the above, grow 90 km (55 mile) further east from its last most easterly range at Lake King. 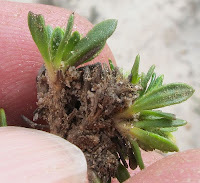 Scaevola humifusa is normally found from Lake King to Ravensthorpe, then sweeps north to below Geraldton and returns to about 70 km north of the Lake King occurrence. 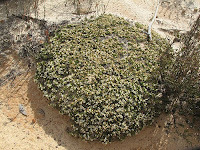 The colony above had around 20 plants and was growing in a coarse sandy soil over a sand/clay base, where seepage flowed. 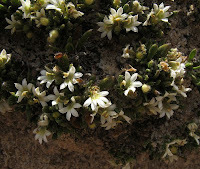 This species is called the Procumbent Scaevola, as the stems trail over the ground but do not take root. The fan-shaped flowers are little more than ½ cm (1/4”) across, but being numerous and combining with a compact cushion base, provide a visually attractive scene. 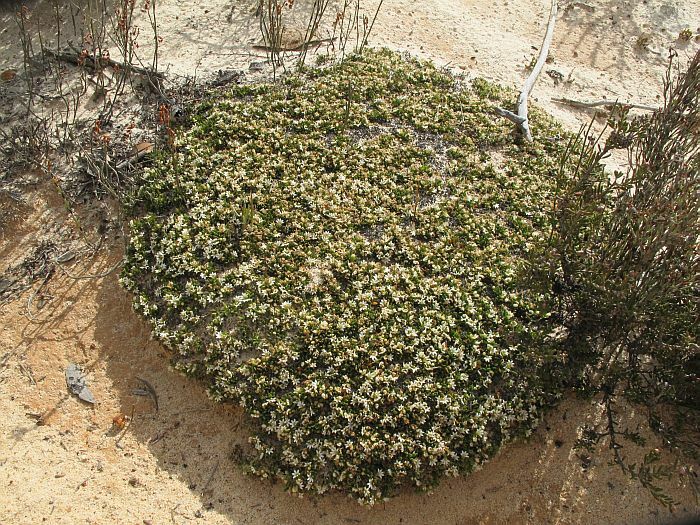 As this plant was restricted to the seepage zone, it obviously requires the additional moisture from this habitat. 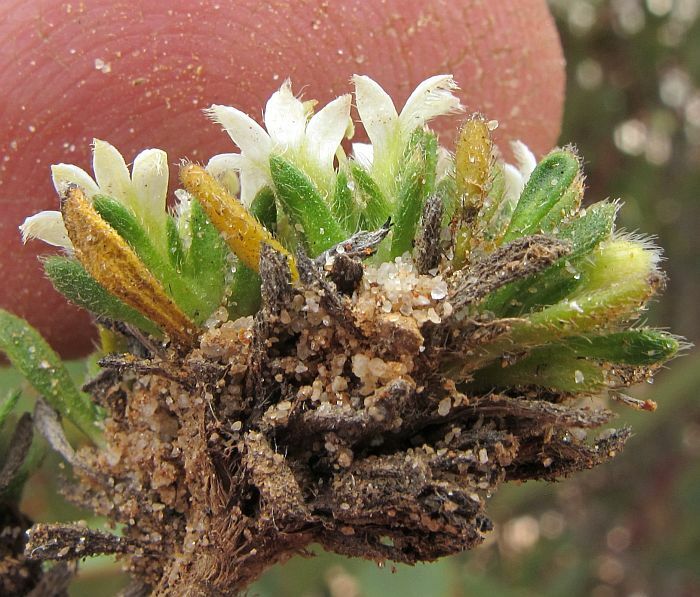 Consequently, in this often dry region it would be highly dependent on the availability of seasonal rainfall and has been noted flowering anytime from August to January. The above were encountered 2-3 years after a fire, in late September of an average year.